We served our Nation with Honor and Serve our Communities with Pride! VETS offers a variety of ways veterans can volunteer to serve their communities. VETS has many benefits and services for enrolled veterans and their families. VETS services and benefits are available to veterans who enroll in the National VETS Archives. All persons who have honorably served in the U. S. Armed Forces are eligible for enrollment. This includes active duty, Reserve and National Guard service as well as other uniformed services such as the Merchant Marine. Family members may enroll deceased veterans or those unable to complete Archives registration due to a disability. There are no membership or enrollment fees for eligible veterans. VETS reviews all enrollments for eligible Archives registration. All approved submissions are emailed a printable VETS ID card and information about VETS benefits, services and instructions about how to participate in the activities of selected VETS charities that support veterans in entrepreneurship and business. The primary mission of VETS is to support veterans and charitable activities that provide veterans with information about starting and operating a commercial business enterprise. This includes offering entrepreneurial education, mentoring and financial assistance to start or grow an existing business. A VETS consumer benefit is the “We Honor VETS” program. Local businesses, professionals and approved individuals sponsor the “We Honor VETS” program on an annual basis. They offer recognition. special rewards and savings for veterans who have enrolled in VETS or have satisfactory veteran identification. The sponsors are easily identified by VETS door decals. In VETS-approved local communities, VETS media partners provide marketing and promotional message opportunities to local “We Honor VETS” sponsors. Sponsors who wish to participate are encouraged to contact VETS or an authorized local VETS representative. How VETS Continues to Serve! Veterans learn valuable skills while serving honorably in the Armed Forces. They also learn about key personal behaviors including leadership, duty, teamwork and how to deal with challenges and solve problems. Veterans are professionally trained to complete their assigned tasks. These abilities and attitudes don’t end when veterans return to civilian life in their communities. At VETS, we offer an opportunity for veterans to continue their dedication to community service by creating a VETS Volunteer Program in each participating community. Local media assist in this process by publicizing the availability of VETS volunteers and work groups to tackle tasks that qualify for volunteer assistance. Veterans who enroll in VETS are given the opportunity to volunteer and choose the skills and tasks they are willing to offer to others. Merchants and other sponsors are welcome to participate by donating materials and other assistance at the national or community level. Once a veteran has enrolled with VETS, a whole new world of opportunity is available to help with personal and business goals. These include providers of home loans, education, medical and other consumer benefits. 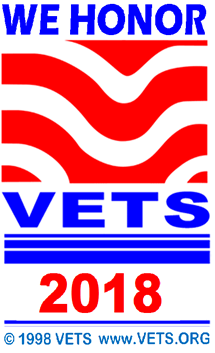 VETS also provides current information about reunions, meetings and special events. VETS also provides information about benefits available from the Veterans Administration and other agencies and organizations that support veterans.